As we get closer to September, iPhone leaks are pouring our more and more. The most significant leak so far has been from Apple itself when unreleased HomePod firmware was leaked and later torn apart. 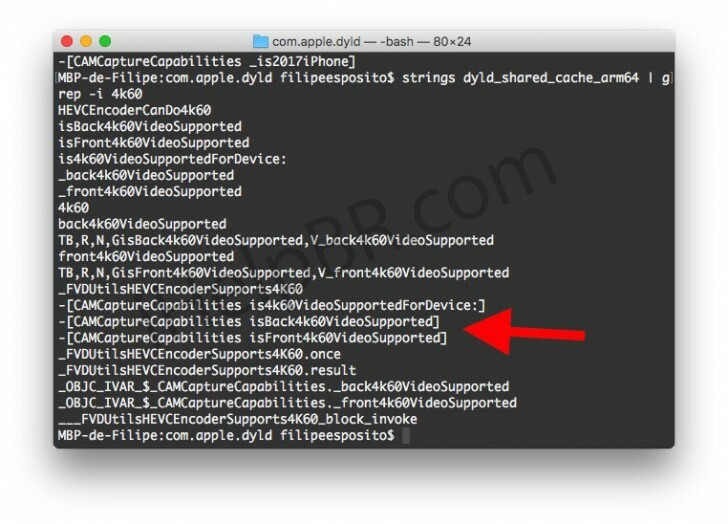 Another new piece of information uncovered by iHelp suggests the iPhone 8’s main camera could record 4K video at 60 fps. A screenshot of the code uncovered can be seen below. The defining piece of code is: [CAMCaptureCapabilities isBack4k60VideoSupported]. There’s another identical piece of code that says Front instead of Back, which suggests the front camera might even be capable of video recording in the same resolution and frame rate as the back camera. When iOS 9 came out, there was similarly uncovered code that suggested the front camera would gain a panoramic feature, 1080p @ 240fps slow mo, and flash. Only one of those things did end up happening, and that’s the front-facing (software) flash. While it would be cool for the front camera to record in 4K AND at 60 frames per second, we just don’t see it happening. Even Apple would wait at least a couple of years after the main camera got the same feature before putting it on the front camera. We’ve got the impression that Apple doesn’t want customers to have everything, all at once. We could see Apple releasing the first smartphone capable of 4K video at 60 fps. After all, Apple’s High Sierra update for MacOS brought support for the standardized successor to H.264 called HEVC (H.265). The new format takes up about 40% less storage than H.264. In any case, 4K at 60 fps is a good move on Apple’s part. Maybe it’ll put the iPhone back at the top of smartphone photography again. With other compelling smartphone cameras like the HTC U11, Google Pixel, and Galaxy S8, Apple must be looking to step up the imaging game.